The layout of this Unit is Perfect for Two Couples traveling together wanting to share very affordable expenses, great for Families or for the Single Couple wanting that romantic getaway. This Lovely Condominium is still like Brand New, just completed in May of 2007. Girdwood Rentals & Accommodations B205 is located on the Second Floor. The Building Unit B205 is in was completed in 2006, is a secured building and has underground parking as well as elevator access to the Condominium. Please check out our website for other Units that are available. The tastefully decorated 1100-foot condominium is spacious, one level and has all the right amenities to make you feel right at home. There is a Flat Screened TV with Cable and an Electric Fireplace for warmth and ambiance. The Kitchen is fully equipped for savoring your own home cooking. The two bedrooms both have either King bed or twin beds making it versatile for couples or singles traveling together. There is also two private bathrooms, each has a hair dryer for the travelers convenience. This Unit also has a full size stack Washer and Dryer. 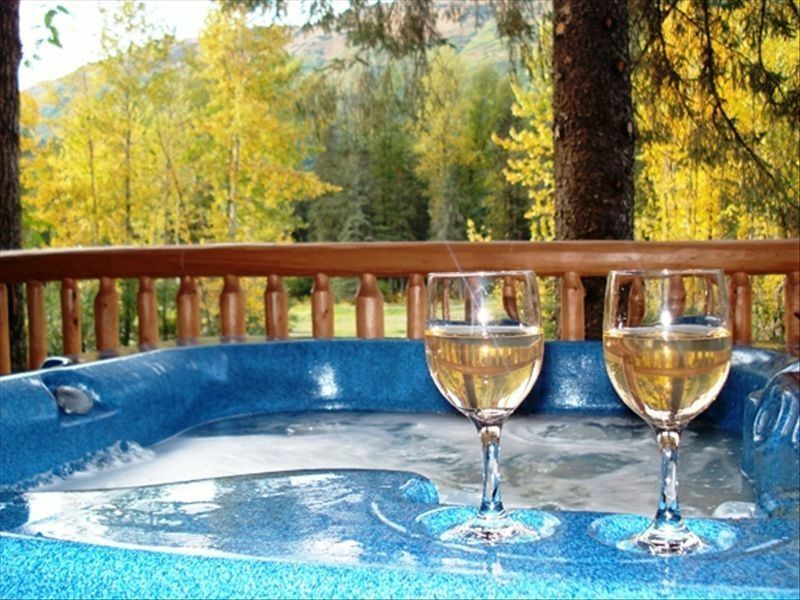 There is large covered deck with a 6 person Hot Tub waiting for your to soak in after a day of great skiing at Alyeska Resort during the winter or after the numerous hiking possibilities in the summer. There are views of surrounding mountains from the deck and bedrooms. There is also a shuttle service (a short walk across the street)to take you to the ski lifts which is about a mile away. This Condo and others we have are within walking distance to great restaurants, Double Musky being one of the best in Alaska. Featuring both Style, Comfort, and Convenience, you'll want to stay for more than one night! The condo was very clean. Kitchen had all the amenities we needed. Spacious rooms and bathrooms. Easy to check in and out. Would stay again! Close by new township of Girdwood. Good restaurants and grocery store within walking distance. Nicely appointed and very clean. Elevator up to second floor and warm indoor parking a plus. Hot tub hot and in good shape. This is an honest review and please do not take any of it negatively. The condo is very easy to find and in a nice quiet location for a winter getaway. Instructions for location of condo, lock box and garage access were great. Condo is beautiful, clean and kitchen has all the amenities you could think of. Cable tv and WiFi provided. It was nice to have the option to split the 2 king beds into 4 twins and there were also 2 (double size?) rollaways beds in the closets. The twin beds have very firm mattresses. The hot tub was great and relaxing. The only thing that prevented me from totally enjoying my stay 100% were all the rules and advisements of what charges would be incurred if not followed. The rental agreement was very intimidating and I became obsessed with making sure everyone in my party followed all the rules. So much so that I had anxiety at the end that I would not get my deposit back even though we followed all rules. I understand why the rules are there: remove shoes before entering, shower before and after hot tub, use provided face wipes to remove makeup instead of wash cloths. We were also charged a cleaning fee for towels, bedding and vacuuming and advised we would need to wash our own dishes, wipe down the counters, table and stove and take out all the trash. I did enjoy my stay and didn’t really have an issue with the rules except that there were so many. This was my first VRBO so I don’t know if that’s normal? All in all a pleasant stay in a beautiful and clean condo. Good location near everything you need; slopes, groceries, restaurants and more. I am happy you were please with the Condo and the amenities. I am sorry you felt you could not be comfortable with the requests that are asked of each guest. They are simple request such as you have mentioned, yes, putting your dishes in the dishwasher & starting them at least & wiping down the kitchen. The guest is provided dishwasher tabs & dishwashing liquid which help to accommodate these simple request. We do not expect perfection; this is a very common request as well common courtesy at any rental in any place, as well as taking out your trash. Yes, it is normal when you go through VRBO or rent any private property, they do ask that you do these common things. It is a private home/property a person is renting, not a Hotel. I think that is where people misunderstand, a hotel does not require you to do this, but neither do most of them have kitchens. A private property with a hot tub also has to have hygiene request so that the hot tub does not get abused or cause an issue with the equipment. This person took very wonderful care of the property of which I do appreciate. Their security deposit was returned through the VRBO system the very next day, and prior to this review. All of my reviews are very good and none of them ever mention me taking their security deposit. If I have ever had to take a partial amount of a persons deposit (which is very rare) is has been for a very good reason, it is brought up to the person prior to taking it, along with proof and costs involved. I assure you it has never been over someone not doing their dishes all the way or taking out the trash. I understand this being your first time in renting a property where you might be more concerned, & again I do apologize that you felt nervous about your security deposit. The Rental Agreement is in place to Protect the Owners Property of which I am entrusted to take care of. There are a few people who are not as conscientious as you and when renting to the Public, a person does not know who will or will not take care of a property, so a Rental Agreement is necessary. I have been managing properties for 20 years so I have seen many things & the request in place are all very normal & work well for all involved. I would urge those who rent my rentals, if they are not comfortable with the simple requests to ask me about them so that they will be made to feel comfortable. I do appreciate your taking the time to write your review. Great Condo with everything you need for a great stay. Loved the layout and the hot tub was a great bonus. Situated close to Alyeska. Very clean, easy to get to. Great instruction to get keys and garage location.. would stay again..
Spotless and peaceful. Fun location near ammenities; walking distance to awesome food. Good communication and instructions from PM. Great girls weekend in one of my favorite communities in AK. Rates are 1-4 persons. There is an additional fee of $25 for 1 person or $50 for 2 additional persons ages 2 on up. Peak times of Christmas/New Years, March & Summer (May 15th - September 15th), Cancellation policy is 45 days prior to Reservation. If cancelled less than 45 days, a $50 Handling Fee applies and refunds will only be given if we are able to rebook the reservation. All other timeframes, the Cancellation Policy will be 30 days prior to reservation. Cancellations less than 30 days will be charged a handling fee, and a refund will only given if we are able to rebook the reservation.